How Can You Clean Your Diamond Ring at Home? A diamond ring may very well be one of the most valuable possessions you own, so it is important to know how to care for it properly, not only to maintain its beauty but also to make sure you do not damage your gorgeous jewellery. Diamonds get their sparkle from the way light reflects in their facets, so any obstruction of light from dust, lotion, or oily build-up reduces their ability to shine. 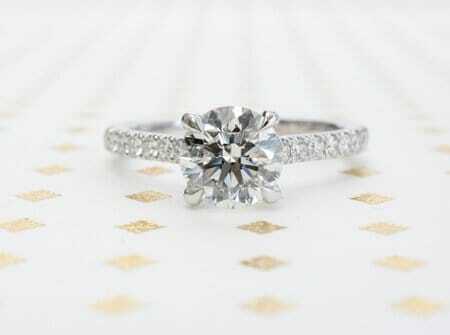 Before you clean your ring, make sure to check that all the prongs are tight and no stone is wiggling in its setting. If there are any minor issues, trying to clean the ring at home may make them worse. The first thing to do before cleaning a diamond engagement ring is determine the materials of the ring. Are there any gemstones on the ring? Are they hard gemstones like sapphires or rubies, or are they soft gemstones like amethyst or aquamarine? Are there fragile materials like pearls or opal? Is the metal gold or platinum, or is it silver? If the ring only has hard stones like diamonds, sapphires, and rubies and is made from gold or platinum, it is very easy to clean your ring effectively without having to worry too much about damaging it. A professional jeweller’s secret weapon is Mr. Clean. Take one part regular Mr. Clean and four parts warm water to scrub it lightly with a soft toothbrush. The ammonia in the cleaning product leaves a gorgeous streak-free shine. Another option is readily-available jewellery cleaning kits, which can be purchased at jewellery stores and national chains. 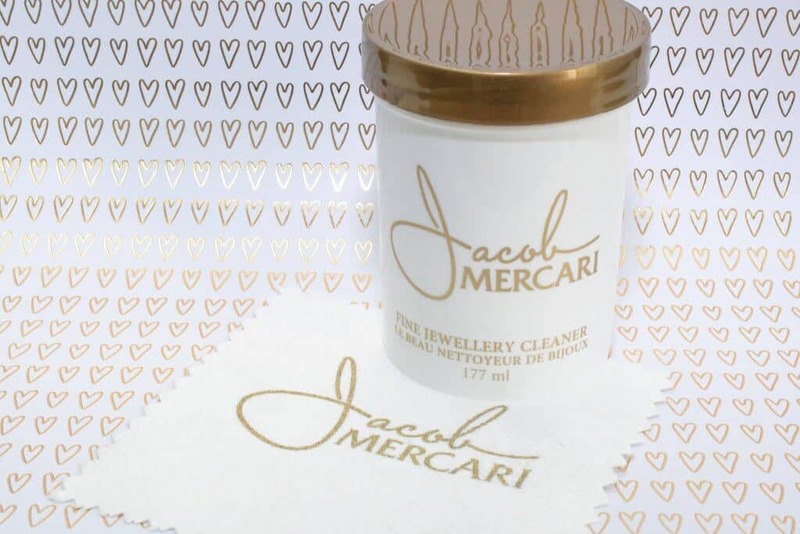 We at Jacob Mercari offer cleaning solution to our customers as a free gift with any engagement ring purchase. If the ring has any softer stones or is made from a softer metal like silver, it’s important to be a little more careful. Using a squirt of a mild, unscented detergent like Castile baby soap in some warm water on a soft cloth will help get the ring sparkling like new. If the ring has very fragile material like pearls, which are not stones but actually organic material, it is best to simply wipe clean with a soft cloth and leave the deep cleaning to professionals. Always completely dry jewellery after cleaning it, as water can damage pearls and tarnish silver. Occasionally, jewellery becomes very dirty; people forget to take wedding rings off before starting a DIY painting project, for example, or an heirloom ring spends decades collecting dust. When a ring needs a deep cleaning, it is a good idea to go to a local jewellery for some professional help. It may be tempting to try to use a sharp object to gouge out the crud under a set stone or to turn to harsh chemicals to dissolve stubborn build-up, but these methods are dangerous and will likely result in irreversible damage. It is important to keep your beautiful jewellery clean, and it’s easy to do at home, but caution is the most important thing. When in doubt, turn to the professionals for guidance and help.